Checkout is always one of the most important steps of every Ecommerce website because this is the process customers make their final decision to pay for an order on stores. Therefore, looking for the most effective solution to optimize the checkout page as well as improve customer experience to make payment is considered as the pioneer concern of business. For Magento, it has become easier than ever with One Step Checkout Magento 2 extension which turns the default checkout page into one page only. By installing this module, a Magento online store will get huge benefits for both customers in the purchase process and even store owners in sale management. In this article, we will together figure out top 4 biggest benefits of One Step Checkout Magento 2 extension for buyers and business. It is obvious that customers often take much time to finish their checkout process with default One page checkout. 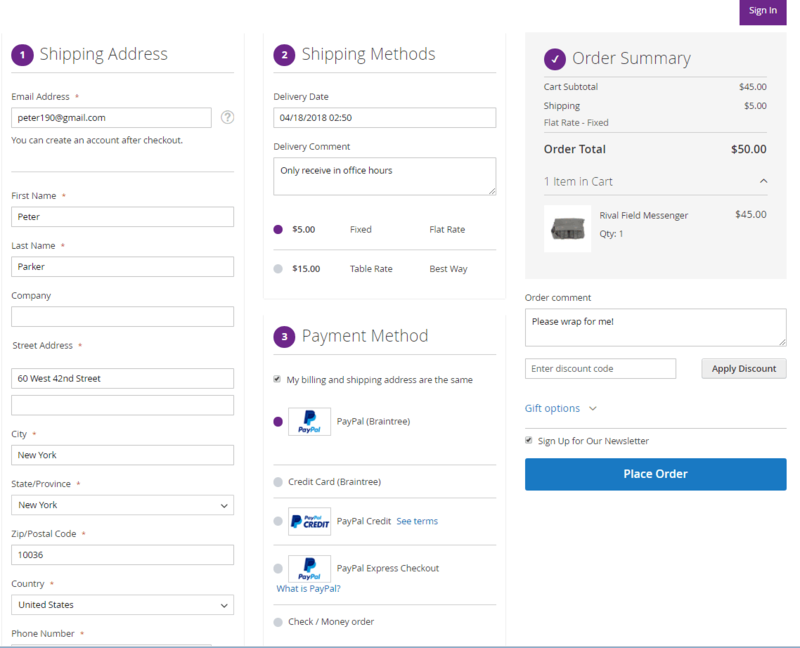 Although this checkout page is also called one page checkout, it contains 2 separate steps: Shipping address and Payment & Reviews. Therefore, customers are required to complete all information in the Shipping section, then are allowed to navigate to Payment & Reviews. To get more information about default, you can read our previous blog post about “Enable Default One Page Checkout Magento 2” – we already made a detailed explanation about this issue. When installing One step checkout Magento 2, purchasers now process fewer steps than before because 2 default steps are combined in one page only. Customers can complete their information at once without clicking Next or Back buttons, especially in case they want to modify or change. Moreover, autocompleting shipping address or ajax loading when having any change are 2 outstanding functions to help customers to speed up their checkout process. According to research by Baymard in 2017, it is shown that 28% of US online shoppers have abandoned their shopping carts in the past quarter solely due to a “too long/complicated checkout process”. Therefore, making checkout in one step is useful to encourage customers to complete their checkout without any hesitation. It takes it for granted that buyers now feel quite comfortable to fill in information and place order one one page checkout, which helps online stores to reduce abandonment cart rate as well as increase conversion rate and boost up sales. 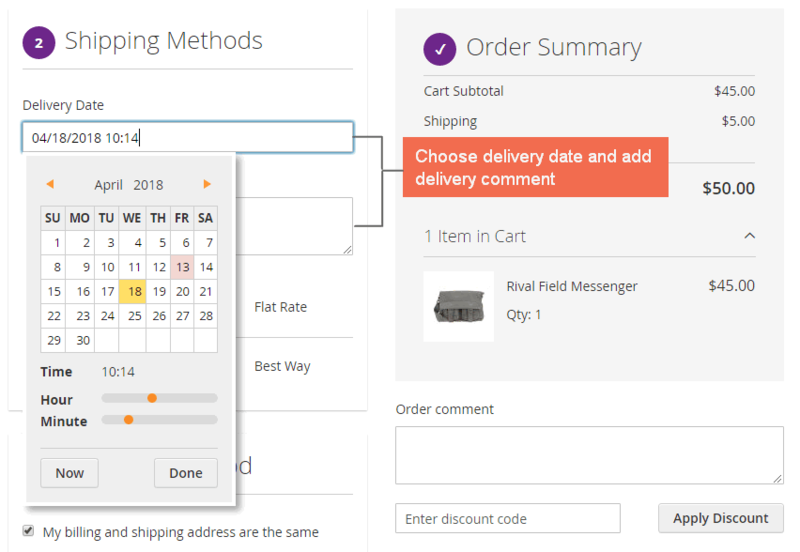 In the default checkout page, there are no additional options for customers to get more custom demands such as delivery dates and times, gift messages, order comment or newsletter subscription. Meanwhile, Ecommerce always appreciates personal customer demands and is very flexible to enable them to get their wants via functions on websites. Therefore, One step checkout Magento 2 extension adds such necessary functions to help buyers to control their orders more effectively. They now can select suitable delivery dates, give notices about delivery or orders, add gift messages and subscribe newsletter right in one page checkout. It is so great, right? Beside shopping on computers, Mobile shopping is now more and more popular over the world. Hence, responsiveness on devices is necessary to help the business avoid losing potential customers and sales as well. 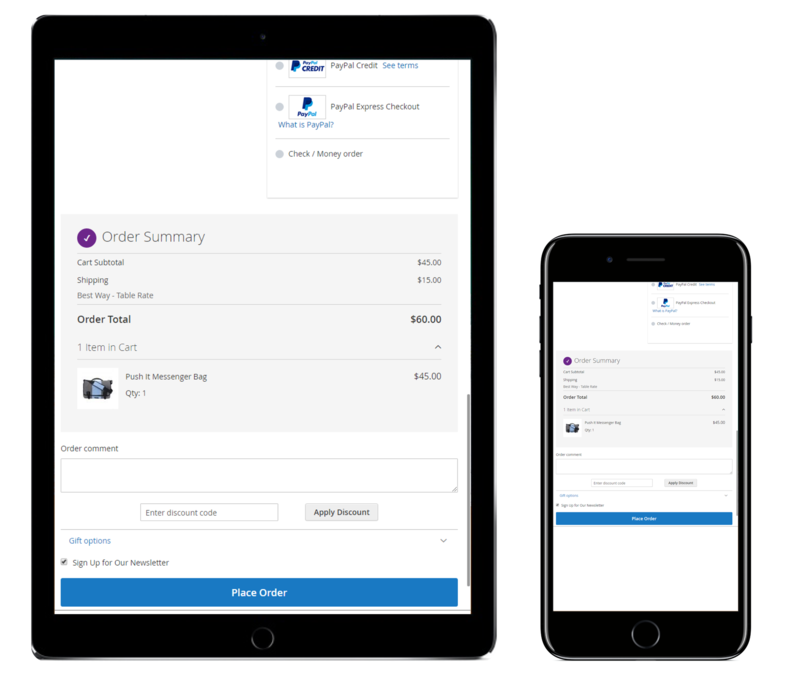 Using One step checkout Magento 2, this issue becomes so simple because the one-page checkout is responsive in all devices from desktops, tablets to mobiles. Everything is optimized to bring users the best layout which is friendly and easy to use. With the above interesting benefits, it is guaranteed that your website will be more user-friendly and contributes to improving sales as well as customer satisfaction. Are you ready to get it now! Above is 4 biggest benefits for which One step checkout Magento 2 extension brings to your websites. With this module, customers can get an awesome checkout experience while store owners can avoid cart abandonment and increase sales effectiveness. Are you ready to get One Step Checkout Magento 2 extension for your stores? Don’t forget to contact us with attractive promotions!